An article to be published in Plos One describes how Inserm researchers have succeeded in preserving the visual function in rats suffering from glaucoma. This disease is associated with an abnormal increase in intraocular pressure and can lead to blindness. 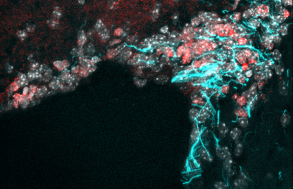 The team of researchers directed by Christophe Baudouin at the Institut de la Vision ((Inserm/CNRS/UPMC) focussed on inflammation-specific molecules: chemokines. Blocking one of the chemokines (CXCR3) led to reduced intraocular pressure, by restoring normal aqueous humour flow, thus protecting the retina and the visual function. Glaucoma is the second leading cause of blindness across the globe, affecting fifty to sixty million people, 6-7 million of whom are blind. 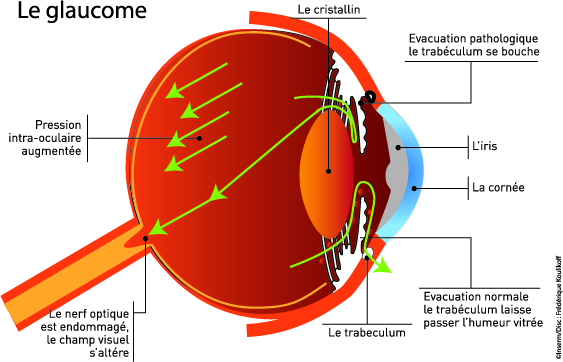 In France, approximately 800,000 people receive treatment for glaucoma. The disease is characterized by the progressive destruction of the optic nerve and an irreversible alteration to the visual function, generally associated with an abnormal increase in intraocular pressure. This high intraocular pressure is caused by an obstruction to the normal aqueous humour flow on a specific ocular structure: the trabecular meshwork. However, there is little understanding of the degeneration of trabecular tissues, which causes this malfunction. Current treatment for glaucoma does not directly target the original pathology of the trabecular meshwork.This could partly explain why treatment frequently fails, sometimes leading to blindness even with access to the best possible medical care. 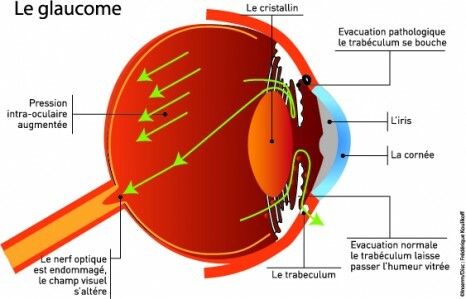 The team of researchers directed by Christophe Baudouin at the Institut de la Vision is dedicated to studying physiopathological mechanisms responsible for glaucomatous trabecular pathology, and, more specifically, the role of specific “chemokine“ molecules in inflammation. Several researchers from the team have recently demonstrated on the tissues of patients suffering from glaucoma, and on a human trabecular cell line, there is a balance between the CXCL12 chemokine and a truncated form of this molecule, SDF-1(5-67). Whereas the first molecule encourages the viability of trabecular meshwork tissues via the CXCR4 receptor, its other form causes the loss of the trabecular meshwork via the CXCR3 receptor. It would appear that the transition from a “healthy” form to a truncated form is driven by a specific environment and the cytokines and metalloproteases involved in glaucoma. In a second phase, the researchers used an animal model of glaucoma and observed that blocking CXCR3 reduces intraocular pressure and restores the trabecular filter function, thus preserving the visual function by protecting the retina. This research has improved understanding of glaucoma. As Alexandre Denoyer, the leading author of the publication explains: “The novel strategy targeting trabecular chemokines could result in the development of an innovative treatment to replace or complement current long-term treatment using eye drops”. Alexandre Denoyer a,b,c,d, David Godefroy a,b,c, Isabelle Célériere, Julie Frugier a,b,c, Julie Degardina,b,c, Jeffrey K. Harrisonf, Françoise Brignole-Baudouina,b,c,g, Serge Picaud a,b,c, Françoise Baleuxh, José A. Sahela,b,c,d, William Rostènea,b,c,1, and Christophe Baudouina,b,c,d,1. of Florida, Gainesville, FL, USA.